Ireland is known as the "Emerald Isle" due to its lush, green vegetation. The island is a popular tourist destination because of its gorgeous country views, its beautiful landscapes, and its many castles. Visitors with an Irish heritage also enjoy tracing the steps of their forefathers. 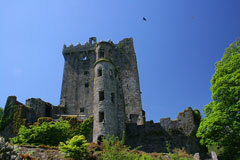 Blarney Castle is one of the best known castles. It was built in 1200 AD near Cork and is now partially collapsed. Some of the castle's rooms are accessible and at the top of the castle lies the Blarney Stone. The stone is popular with tourists who hang upside down and kiss the stone in hopes of being given the gift of eloquence. Trim Castle is the largest Norman castle in all of Europe and features a unique three-story tower. Unlike most towers, this one is shaped like a cross and features twenty corners. 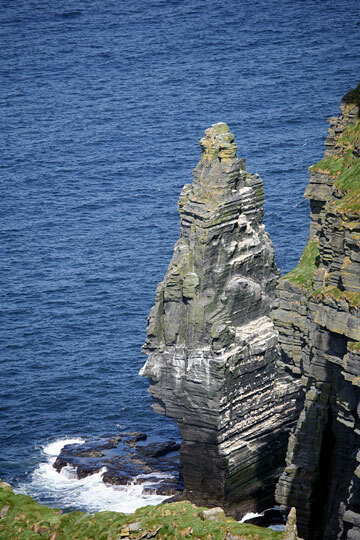 Those wishing to get a little closer to nature and take in some beautiful scenery should look no further than the Cliffs of Moher. These cliffs are located in the parish of Liscannor and rise 400 to 700 feet above the Atlantic Ocean. For a better view, head to O'Brien Tower. Located at the midpoint of the cliffs, this round stone tower was built by Sir Cornelius O'Brien in 1835 so that tourists to the area could have a better view of the sea. This county, situated near Dublin, is known for its mountains, rivers, lakes, and views of nature. Many popular tourist destinations are located within the county, including Powerscourt House and Gardens in Avoca and the monastery in Glendalough. Glendalough is a village founded in the 6th century by St. Kevin who also started the monastery located there. The monastery includes a round tower that was built to protect the religious relics and books from the invading Vikings. There is also a Celtic High cross on the grounds known as St. Kevin's Cross. 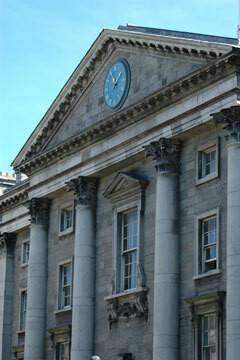 Dublin is Ireland's capital and the area is full of many interesting sites. Here, visitors can feel the pulse of city life in Ireland and take in some local culture. Visitors will find good museums, restaurants, and much more. For the scholarly inclined, a trip to Trinity College is in order. Trinity College's Old Library holds the Book of Kells which dates from the 8th century and the Book of Durrow which dates from the 7th century. Located in the County Meath, Newgrange features a Neolithic Passage Tomb. The tomb is older than the Egyptian pyramids and is a one of a kind find. No one really knows why it was done, but the tomb was built so that sunlight only shines in the main chamber of the tomb on the shortest day of the year. While in the area, drop by the nearby Hill of Tara. This area served as home to the ancient kings of Ireland, and is worth a stop.